We are excited to play a couple gigs in July. The band has been rehearsing and I think it’s gonna be smokin’. We’ll have all six ep’s with us too. Here is the Facebook invite page. 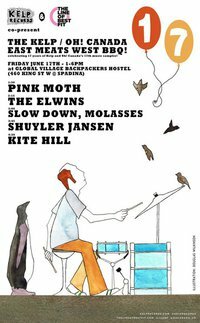 Pink Moth will play this year’s Kelp Records BBQ this Friday afternoon, June 17, 1:30pm set time. Free food starting at 1! It is happening at Global Village Backpackers, King and Spadina. Take the day off from that pesky job- it’s summertime! Here’s the facebook invite. This is the last show of the tour. Really feeling the pull of my home and bed in Canada. What a wimp! I get my bits together and hop on the train through the former East to Erfurt, a nice town south of Berlin. The venue is excellent and the father/son team of Ralph and Phillip run the show and look after us to the T. It is an honour to play here and it feels good to be welcomed and treated well. Great food and kind people. I am supporting another Canadian act tonight, Brasstronaut from Vancouver. Nice to connect with these guys. We have some good laughs. The place fills up and i do my thing for the last time. It feels and sounds good but the ipod betrays me on the last song. I don’t think anyone noticed. A very drunk spaniard talks my ear off for i while, then i escape to bed down in the band flat while the others go out to party. The next day it’s back to Berlin to squeeze the most out of my last 3 days in the flat before heading to Paris, and home. Back to Berlin. I miss my little balcony and the hammock. We head to Schokoladen to see fellow Canadians Olympic Symphonium, who are amazing, as well as being lovely people. The next day is the house show at Tobin’s place with Snailhouse. We get things ready and make a big dinner for 10 before the show. 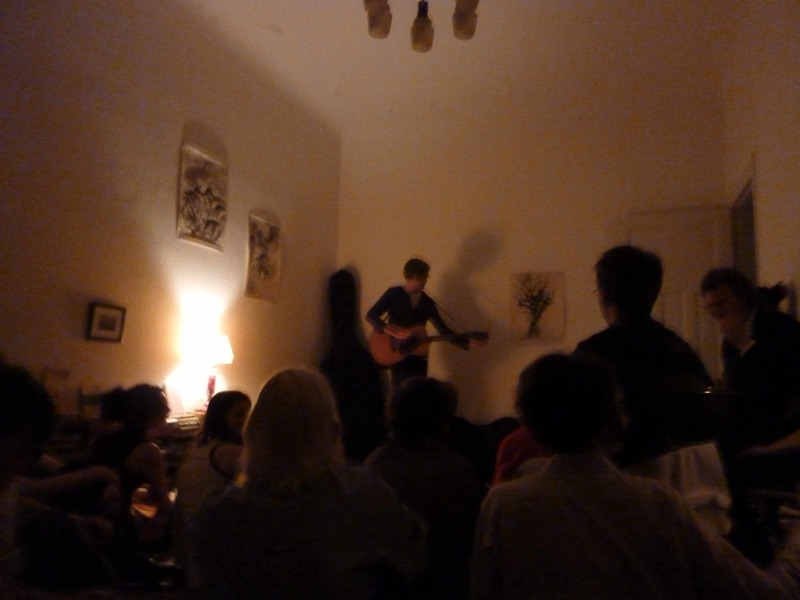 I play my set to a lovely, attentive audience and it feels great. Lots of energy flying around the room. Such a nice intimate show. Then Snailhouse take the stage. They are so darn good. Singing harmonies and that upright bass and those fantastic songs. Inspiring. A very special night where everything seems to fall perfectly into place. I feel lucky to be a part of all this. I am not used to being on a plane for such a short time. I did some reading, had a coffee, looked up, and we were there. Easy peasy to Gothenburg. Hopped on a bus into town and ran into B. Kleinhenz in the street. Funny! He lives across the water, so we get on the ferry. Nice to relax and hang out. Gothenburg has a small town feel and its good to be by the ocean. The show is in a small theater. The Black Atlantic roll into town and we get things going, good to see those guys again! This is a great show in every way. Best one yet. Thanks, Bjorn!